Where in the Northwest can you take a winter walk through 23 gardens overflowing with flowers, fronds and fragrances, and staged specifically for a garden lover's delight? Every February, the Northwest Flower and Garden Show brings together the top horticulture professionals to give us five days of garden bliss. With a theme like "Romance Blossoms," the designers will work hard to create gardens of passion and plant obsessions. On Feb. 11-15, be prepared to walk into another dimension of the sights, smells and sounds inside the walls of the Washington State Convention Center in Seattle. Even without a romance theme, every year that I attend the Northwest Flower and Garden Show, I am swept off my feet. When I walk through the doors, a sweet fragrance lingers in the air. With the excitement of seeing flowering-must-haves tucked away into the nooks and crannies of the display gardens, I fall in love with new plants. Yet I'm not the only one. People from all over the Pacific Northwest and beyond ascend upon the second largest garden show in the U.S. The event brings together gardeners, bloggers, authors, journalists, garden personalities, speakers, landscapers and designers. Anyone with an affinity for growing plants loves the theatrics and the creative ideas that can be used to inspire and unleash creative passion in our gardens. Days filled with numerous seminars and PowerPoint presentations normally sound like another boring day at the office. But, here, the images of flamboyant flowers and fanciful foliage, and are accompanied by presenters singing their praises. The speaker of the moment flirts with a room full of passionate garden lovers. And we are smitten. I am amazed at how far people will travel to come to this garden show. I asked a trio of avid gardeners from Portland why they continually make the trip to Seattle every winter. All three faithfully attend their local garden shows. But by bus, train or car, each one enjoys the journey north. Jeanne DeBenedetti Keyes has made the trip every year for 12 years. 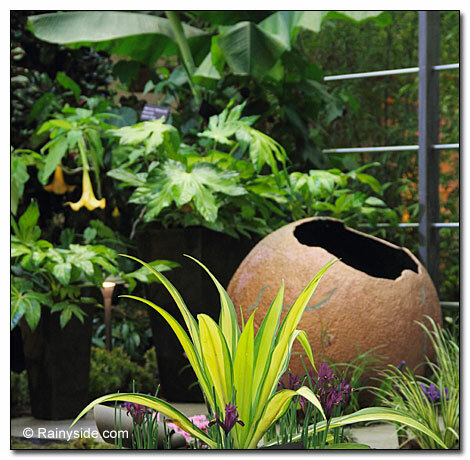 "I attend the NWFGS because I get lots of inspiration from the gardens," she said. "I like viewing the gardens the best, but I really enjoy an interesting seminar and engaging speaker." Jane Finch-Howell shared, "The display gardens are always fascinating, the speakers are top-notch, and the sheer size of the show is compelling in its coverage. It's just the biggest and the best in the region." Ann Amato-Zorich said, "I enjoy the spectacle of it more than anything. The garden installations are wonderful and are far larger than those we have here in Portland. I wish that the displays were even more over the top sometimes, but last year's blown glass garden was by far the most astounding I'd seen yet." All three agree with me that the show jumpstarts the garden season with a lot of inspiration. Midwinter is the perfect time for this regional garden show. The days are still dark, rainy and cold. Over the years attending the Northwest Flower and Garden Show, I've heard many fellow gardeners say they also attend the show because it lifts their spirits. The gardens are normally everyone's favorite part of the garden show. 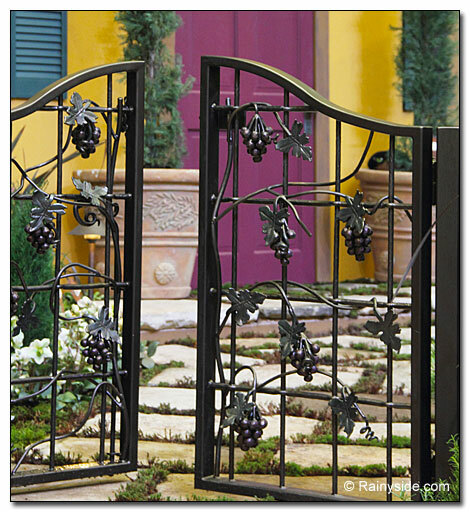 Respected garden designers team up with landscapers and builders to create a fantasy world. Over the years, we've seen everything from handsome industrial modern designs to charming cottage gardens. 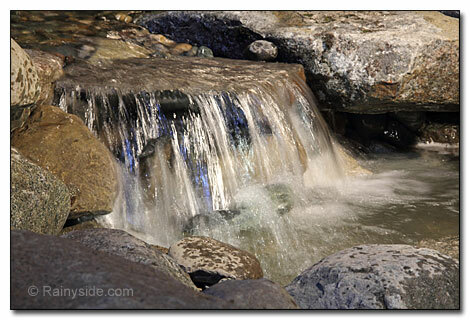 Designers bring us woodlands, flowering oasis, outbuilding retreats and fabulous water features. They give us something for every taste, want and need. Regular showgoer Amato-Zorich summed it up with, "It's the spectacle of what humans are able to annually assemble and create for the show that matters the most to me." Some designs are purely theatrical, and not practical for a typical home garden, yet the display gardens aspire to expand outdoor living spaces beyond our expectations. 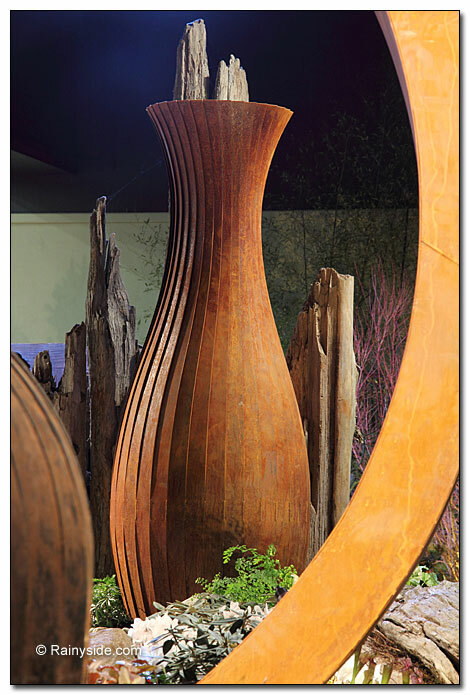 Creativity inspires more creativity, and we all take home from the Northwest Flower and Garden Show excitement to create a better space. 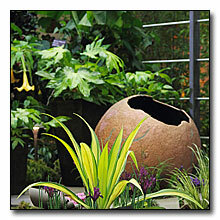 Besides all the romancing, the Northwest Flower and Garden Show has plenty of other venues. "Play With Friends" is a new feature for families attending the event. Friends of the Waterfront Seattle teamed up with show organizers to lead children in interactive activities, including robotized Legos. Then there's the shopping. Perusing the plants in the Plant Market is always thrilling and sometimes overwhelming with the sheer volume of selections for sale — bulbs, plants and seeds. Be careful: The garden show pushes spring fever into full gear. Other exhibitors carry garden art, gadgets and tools. You can find almost anything you want or need for the garden. A newer addition to the show, the Vintage Market, is full of items to be repurposed in the garden. Want to know more about growing Dahlias? Many garden clubs and garden societies have booths at the show with experts on hand to answer your questions, or sign you up for memberships. 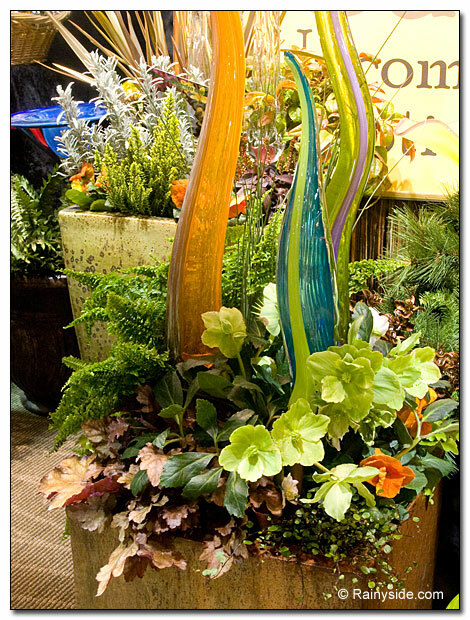 The Northwest Flower and Garden Show is Feb. 11-15 at the Washington State Convention Center, 800 Convention Place, Seattle. Originally written for the Oregonian, February 2015.